ASPEN – At times, the start of Monday’s Aspen City Council meeting resembled more of a love fest or a funeral wake than a gathering to conduct public business, depending on who was doing the talking. The departure from standard procedure was an effort to pay homage to Dwayne Romero, who is stepping down from his council post to serve as Gov. John Hickenlooper’s economic development director. In turn, Aspen’s three other councilmen said their goodbyes to Romero, each with a different degree of seriousness. 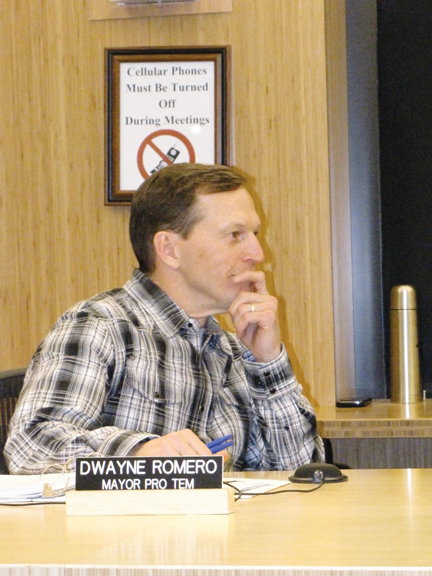 Steve Skadron – who noted that he and Romero were elected at the same time about four years ago – appeared to choke back emotions as he reflected on their work together and wished the departing councilman good luck in his new role. “I’m not dying,” Romero quipped. Later, after more accolades and a tongue-in-cheek proclamation issued by Mayor Mick Ireland, Romero used self-deprecating humor to further lighten the mood. “Six months from now, I’m sure I’ll be living in a van down by the river,” he said. The regular meeting was relatively short, with a few public-hearing items postponed for another time. A planned discussion and action on changes to the election code was postponed to Feb. 28 so that the city’s election commission could make “refinements” to a proposed ordinance, City Clerk Kathryn Koch said. Still, Mayor Mick Ireland allowed comments from Marilyn Marks, a former mayoral candidate who criticized election procedures following the 2009 election she failed to win. It was Marks who first pushed for changes in the city’s election laws, including repeal of instant runoff voting, also known as IRV. Marks showed a stack of envelopes containing November 2010 ballots mailed by county government to several county voters. She said she dug them out of a trash dumpster near the post office, and said they served as an example of problems pertaining to local election procedures. She claimed that anyone could have taken the envelopes out of the trash, as she did, filled them out, signed someone’s name as a witness and mailed them back to be recorded as votes. Councilman Torre expressed shock that Marks would dig mail out of a trash dumpster, suggesting that it might not be legal. Ireland thanked Marks for calling the matter to the council’s attention and said safeguards would be put into place at the city level to ensure that absentee ballots reach the proper voter and that returned mail lands in a more secure spot. In other business, the council extended the negotiation period between the city and the University of Colorado on the Given Institute property until March 14. The negotiation period had been set to expire Tuesday. The University of Colorado wants to sell the land, but negotiations between the city and a private developer with an option on the property recently broke down. No other buyer has come forward. The city hopes to find a buyer who will preserve most of the property for nonprofit or public use, with minimal or no private development. The council also honored Amy Guthrie, city historic preservation officer, and Sara Adams, senior planner, for their work on the Aspen Modern program, and related ordinances 30 and 48, both of which seek to identify and preserve post-WWII architecture in the city. Guthrie and Adams received a City of Aspen Outstanding Employee Team Award, along with a bonus, for their efforts in moving the project forward. They also were instrumental in the production of a film – put together on a shoestring budget – that told the story of the cultural transformation of Aspen from its quiet years to its emergence as a resort community influenced by post-war European transplants. Their work led the National Trust for Historic Preservation to include Aspen as the fourth city in the United States for a special series on the preservation of post-war architecture. “Amy and Sara, your sincere dedication to the organization, professionalism, integrity, healthy perspective and sense of humor are reflected in your performance,” Community Development Director Chris Bendon wrote in a letter informing them of the award.